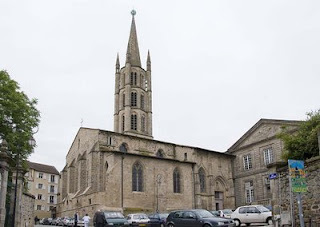 Limoges has a population of about 135,000 and is in the Haute-Vienne department of the Limousin region, of which it is the administrative capital. It is known for medieval enamels on copper, 19th century porcelain and oak barrels used in Cognac production. Not too much to write home about. 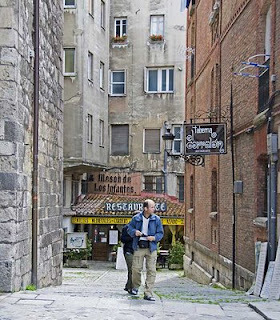 Overall, Limoges exuded a somewhat grim ambiance and, although some restorative work had been completed and more was underway, there were no indications that it would ever become a pleasing tourist experience. Click here for a tour. 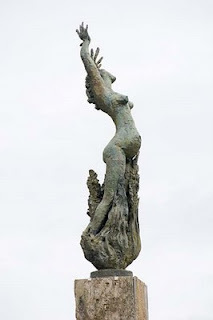 In 1944, in the elevated turmoil following the June 6th Allied D-Day landings in Normandy, French Resistance fighters stepped up their efforts to disrupt German forces and hinder their communications. The German 2nd SS Panzer Division, that had been ordered to make its way across country to join the fighting in Normandy, was one such force that fell prey to an attack by the Resistance. 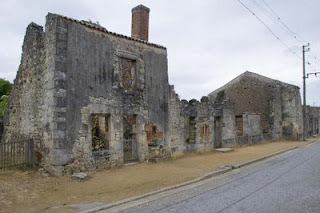 On June 10, 1944, Sturmbannführer Adolf Diekmann of the 4th Waffen-SS Panzers informed his commanding officer of a collaborator claim, concerning a 2nd SS Panzer Division officer being held by the Resistance in the village of Oradour-sur-Vayres. Diekmann was authorized to arrest the Mayor of the village and select 30 other citizens for a hostage swap to free the captured German. Later that same day, Diekmann's battalion mistakenly sealed off the town of Oradour-sur-Glane, having confused it with nearby Oradour-sur-Vayres, and ordered the occupants to assemble in the village square, to have their identity documents examined. The women and children were immediately moved to the church and locked inside while the men were taken to a series of barns and slaughtered by machine guns aimed at their legs, with the express intention of prolonging their deaths. The soldiers burned barns and the corpses and just five of the 195 men survived this carnage. The Germans next set fire to the church and then stood guard with machine guns, shooting would-be escapees as they attempted to exit the building. 247 women and 205 children died in this chapter of the massacre with just one woman surviving. At this point, the over-zealous Diekmann looted the houses and then razed the village. 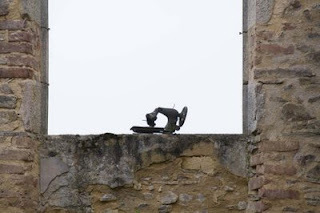 When the dead were buried a few days later, it was sadly confirmed that 642 inhabitants of Oradour-sur-Glane had been brutally murdered in just a few hours. Diekmann himself was killed in action some days later, by which time the Nazi authorities were preparing to prosecute him. After the war, General Charles de Gaulle decreed that the old village would not be rebuilt but would be dedicated as a memorial to the vile excesses of the Nazi occupation. 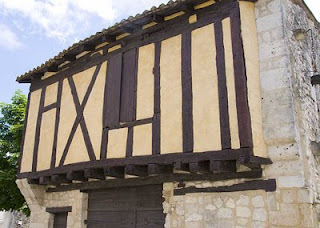 A new village was built on a nearby site and Oradour-sur-Glane, with a population just over 2000, is now a commune of the Haute-Vienne département. In 1999, French President Jacques Chirac formally opened the Oradour-sur-Glane Centre de la Mémoire. Slideshow here. Shortly after leaving Sarlat-La-Caneda, we took a wrong turn and found ourselves on a minor road scarcely wider than Heidi. Not being prone to turning back, we didn't, but instead bravely re-routed to our destination. A few white-knuckle miles later we found ourselves at a crossroad populated by a few buildings which, upon closer inspection, turned out to be the tiny Dordogne village of St Geniès. In addition to a butcher, a garage, a patisserie and a post office there is a 12th century chapel, a 400 year old stone-roofed church complete with Rapunzel turrets and, to top it all, an open-air market every Sunday morning where anything from Turkish delight, to goose neck stuffed with foie gras, can be bought. Details here. Our visit to Sarlat-la-Canéda was awesome. The weather co-operated, to our good fortune it was market day (Sunday), the old city turned out to be essentially traffic free and its condition was exceptional. 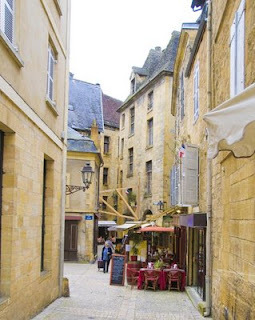 With a population of about 10,000, Sarlat is in the Dordogne department of southwest France and is, hopefully, awaiting elevation to World Heritage status. 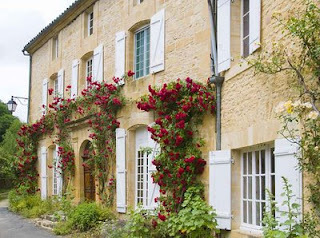 Devoid of major historical milestones and with little in the way of significant attractions, previously prosperous Sarlat fairly fell off of the mainstream radar after the 18th century. It then languished as a backwater for a century and a half, only to be rediscovered in the latter part of the 20th century, when road transportation began to supersede rail and river and brought traffic back to the area. 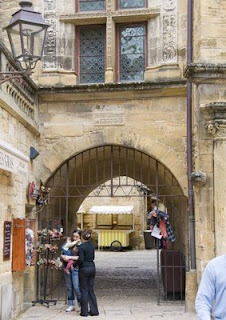 During this hiatus, many, more industrious towns had been busy tearing down and rebuilding while Sarlat remained solidly rooted in the 14th century. In the early 1960's the city was renovated with funding from the Ministry of Culture and is now a prized example of Medieval France. 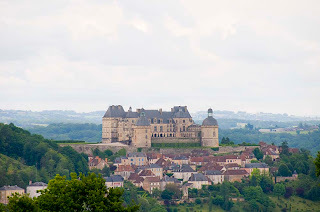 The Benedictines established a monastery in Sarlat at the end of the 8th century which, by the 14th century, became the site for the new cathedral. At the end of the Hundred Years War, the city - indeed the whole of southwest France - was ceded to the English under Edward III, in exchange for renouncing his claim to the throne of France. For more pictures, click here. Where the D14 road crosses the border between the Dordogne and the Lot-et-Garonne departments is the village of Issigeac. 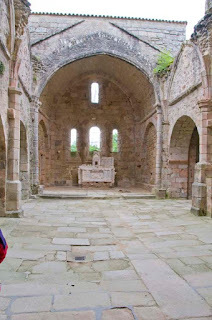 Built on the site of a wealthy Gallo-Roman villa that later gave way to a Merovingian necropolis and then, around the 6th century CE, to a Benedictine monastery dedicated to St Peter, the village has some unusual features. 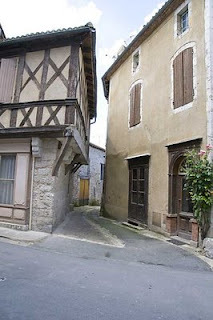 Chief among these is the mix of timbered medieval buildings with much later stone houses from the 16th and 17th centuries. 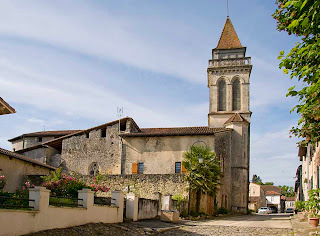 The current church, St Félicien, was built on the site of the priory and completed in 1527. The severe looking Palace of the Bishops of Sarlat stands across the square the church. Curiously, Issigeac has become very popular with British retirees and the Realtor offices we visited were both staffed by English folk. Such foreign interlopers however, are fairly much confined to modern housing in nearby developments. Check here for more views. We were heading for a campsite called Camping Le Pin when we caught an intriguing glimpse of the tiny town of Saint Justin. Next morning we backtracked to check out what we thought we had seen, and we were not disappointed - home to 888 people, Saint Justin was founded by the English in 1280 CE. Slideshow here. 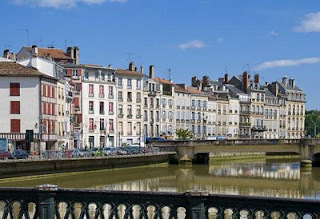 Bayonne, in southwestern France, is at the confluence of the Nive and Adour rivers and is the economic and cultural capital of the Basque Country on the French side of the Pyrenees. Located almost 4 miles from the Atlantic coast it has escaped the worst excesses of tourism, leaving the 40,000 or so residents, to enjoy this historic treasure. The city is split east to west by the River Ardour with - more or less - the old city to the south and the more modern, St Esprit area, to the north. The southern part, in turn, is split into two by the smaller River Nive flowing north to meet the Ardour. 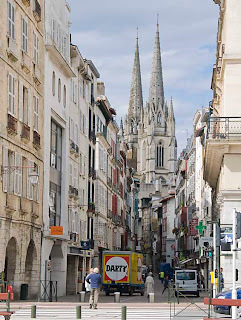 The western chunk of the old city is known as Grand Bayonne while the smaller, eastern piece is Petit Bayonne. Grand Bayonne is home to the Cathédrale Ste-Marie, the towers and steeple of which, provide an impressive silhouette although, as weather beaten as the edifice is, they do look much better from a distance. The church was largely built in the 12th and 13th centuries even though the south tower wasn't completed until the 16th century and the north tower remained unfinished until the 19th. Overall, an enjoyable walkabout in a charming city. Check here for more images. 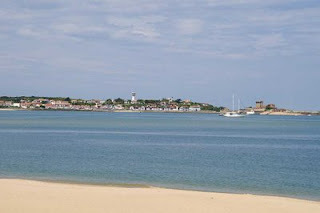 Saint-Jean-de-Luz is in the Pyrénées-Atlantiques department of southwestern France and sits on the French side of the river Nivelle. On the opposite side of the estuary is Ciboure, Spain. 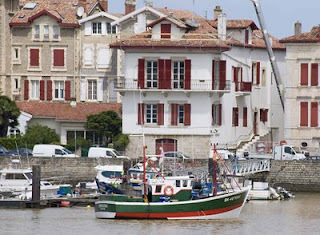 Saint-Jean-de-Luz is an active fishing port as well as a popular resort and is renowned for its architecture, sandy bay and its Basque cuisine. Five miles to the southeast lies La Rhune mountain, a Pyrenees foothill about 3,000 feet high. Louis XIV was King of France from a few months before his fifth birthday until his death, seventy-two years later. He lived from 1638 to 1715 and, in 1660, married Maria Theresa of Spain in the Saint Jean-Baptiste church in Saint-Jean-de-Luz. Maria, the daughter of Philip IV, King of Spain and Élisabeth de France, was the same age as Louis. but she died prematurely in 1683. More views around this delightful city here. Our last stop in Spain, the weather had reverted to cool and damp and we were in Vitoria, a little hill city that should at least be "Closed for Alterations" or, maybe, just Closed. Vitoria is the second largest city in the Basque Country of Spain and is just 25 miles south of Bilbao, the largest city in the region. 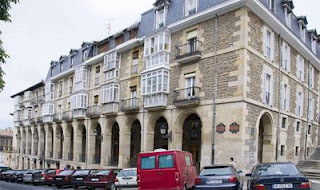 Vitoria was pretty much a sleepy backwater until 1980, when it was chosen as the seat of government for the Basque region. It still seems to be struggling to live up to this honor. Check here for unreadiness symptons. In 581 CE, the Visigoth king Liuvigild, founded the city of Victoriacum to celebrate his victory over the Vascones. Six hundred years later, in 1181, Sancho el Sabio, king of Navarre, built the current "old" city over a small hamlet called Gastiez. Shortly thereafter, in 1200 CE, Alfonso VIII of Castile seized the town and annexed it to the Kingdom of Castile. The town continued to grow steadily and was granted the title of City by King Juan II of Castile in 1431. Over the ensuing centuries, the city prospered within its defensive walls and retains the layout of the medieval town to this day. 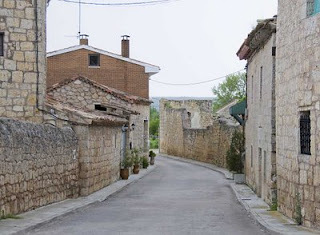 Celada del Camino is a tiny municipality in Burgos province, that was long ago bypassed by the A-62 Autovia. 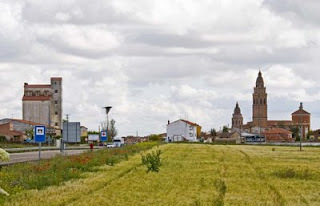 The entire population of 99 people, lives along the main street, Carretera de Burgos, or on one of the half dozen side streets that quickly terminate in farmland. We enjoyed a peaceful lunch here. 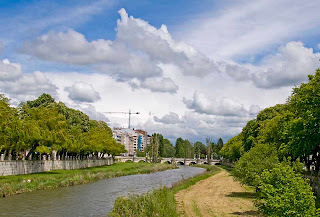 Burgos, with a population of about 180,000, is the capital of the province of Burgos in the Community of Castilla and Leon. With more ecclesiastical monuments than any other Spanish city, including Toledo, the most precious structure is the Gothic cathedral, which was begun in 1221, and sports features of the 13th to 15th centuries. This awesome building was declared a World Heritage Monument in 1984. The Burgos area had been populated for as long as 800,000 years ago before the violent millenium that swept across Europe began in about 200 BCE. At that time, the area was Celtiberian but then the Romans moved in and governed the area until they were vanquished by the Visigoths in the 5th century. In the 8th century, the Arabs swarmed the entire area before they in turn, were beaten back by Alfonso the Great in the middle of the ninth century. A ton of stuff to see in this picturesque city. Check here for more. 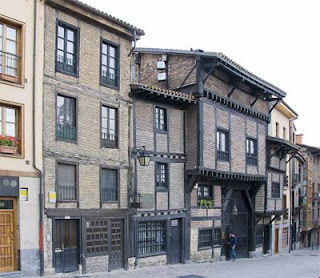 Palencia is a city of about 80,000 people in north-west Spain. 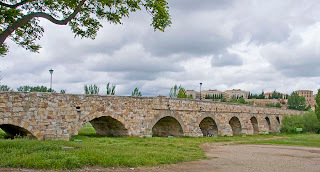 It is the capital of the province of Palencia (like a US county) in the community of Castile-Leon (sort of equivalent to a US state). It is still possible to trace the old city walls that, for the most part, were a forbidding 35 feet in height. 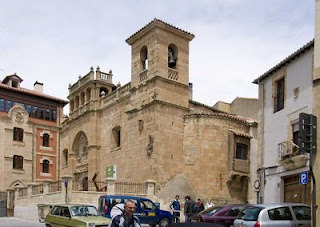 San Antolin cathedral was built over the years 1321 to 1504 and is a highlight of the city. With a typical European blood curdling history, the city was starved into submission by the Romans in the second century BCE, was all but destroyed in 457 CE in the Visigoth wars against the Suevi, trashed again when the Moors arrived in the early eighth century before being restored to normalcy by the first prelate Bernado in 1035. 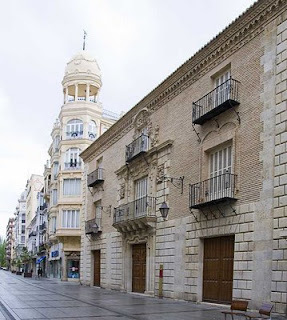 The first university in Spain, the Studium Generale of Palencia was founded by Alfonso VIII in 1208. However, the school did not long survive him, the teachers being drawn to the thriving University of Salamanca. Click here for slide-show. Answer: Don't go to EPCOT! 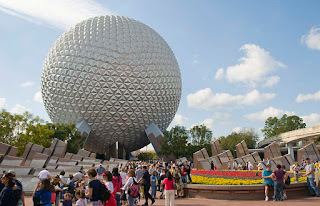 We were in the area and the glossy propaganda stated that the quietest time to visit Experimental Project - City of Tomorrow - acronymically EPCOT - is after Presidents Day and before Spring Break. Marian had visited once before, about 25 years ago; I had never been there, despite having lived in Orlando for five years in the eighties. We thought we had it made in the shade for a leisurely day.With a 9:00 am opening, we set off early to beat the crowds. By 9:20 am we had become part of the ten lanes of stationery vehicles in line at the parking toll booth. With no signs to show the cost, acceptable methods of payment or even indicating that five of the toll trolls were actually on the passenger side of the vehicle, confusion reigned. Thirty carbon emitting minutes later we were at the booth, quickly parted from $12.00 for a parking permit, only to immediately rejoin the traffic as it was funneled back into one lane toward the parking lot. A further ten minutes and we were under the control of a bunch of effete Jobworths, more focused on impressing the world at large by pirouetting about on their Segways, than actually getting folks parked. Oh joy.Next up, following a half-mile walk, was the bag search. Fortunately, we were bagless and skipped this little diversion, while those lucky bag-toters got to stand in line some more.Onward to the ticket office. 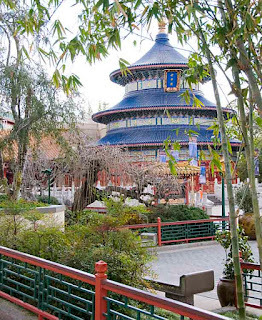 Here, after listening through all the promotions, special offers and disclaimers we were relieved of $75.00 each, plus state tax, city tax, entertainment tax and visitor tax in exchange for our one day single attraction pass. One final hurdle - the turnstile - an idiotic affair requiring individual training for every punter, about half of whom had to be admitted manually since their co-ordination skills were inadequate to the gymnastic intricacies required to operate the machine.Hooray, we were finally in the Holy of Holies. Well, almost. 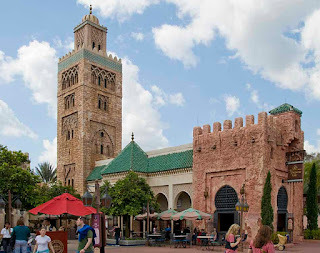 Even though the park opens at 9:00 am, the exhibits, generally, did not open their doors until 11:00 am and anyone with the temerity to arrive before that time would jolly well have to wait around until Disney was good and ready. By 11:00 o'clock of course, every popular exhibit had a line out of its door a couple of blocks long. Stunning piece of planning! As it turned out, this hiatus provided an opportunity to evaluate said exhibits - kitchen history, advanced Wii, world fastest dodgem car and other assorted drear - all designed to delight sub-teens and nothing that we old fogies cared for. The International Village thus became our sole objective and, obediently, we joined the gathering herd waiting for the rope to be dropped opening the way to this bonanza of banality. 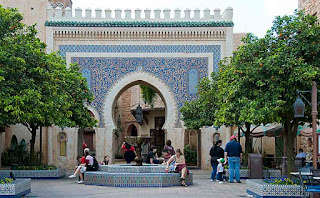 Arranged around a little lake, grandly titled The World Showcase Lagoon, were what purported to be representative pastiches of about a dozen different countries and their cultures - China, Mexico, Morocco, Japan, Germany, Italy and so on. Poetic license on steroids! The realism of some presentations, the bell tower in St Marks Square, Venice for example, was such that we were almost disappointed not to find an air fan at the rear keeping it inflated. Every "country" had the same format - a snack stand with $7.00 hot-dogs, an expensive restaurant, a more expensive restaurant, a gift shop and toilets. 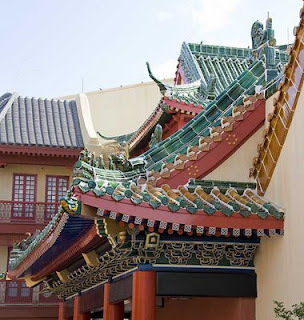 Stylized ethnic decor, seemingly lifted straight from movies like Pinnochio or 101 Dalmations, resulted in a kind of Lilliputian surrealism wherein the sole believable element were the gifts in the Chinese gift store which were genuinely made in China. By noon, we were back on the road pinching ourselves to confirm that we weren't dreaming. If you need further evidence, click here. While whizzing north-east along the A-62 on our way from Salamanca to Burgos in Spain, fate conspired in an instant, in making us hungry, setting the time to noon and bringing us into view of a little burg with two large spires. We slipped off the A-62, that nowadays completely bypasses the town, and followed the old N620 into town in search of a lunchtime parking spot. After lunch we went walkabout - see here for scenes about town. 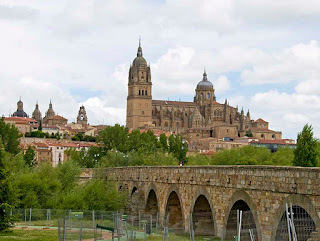 Salamanca, in western Spain, is built on a mountain next to the Tormes River and is one of the most spectacular Renaissance cities in Europe, often referred to as the Golden City for the almost glowing sandstone used in many buildings. The Old City gained World Heritage status in 1988. Check out some views here. 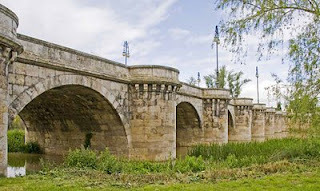 From the south, access is via a 400' long, 26 arch, stone bridge. Fifteen arches are from Roman times while the remainder date from the 16th century. The city has had an exceptionally turbulent history - Celts, Romans, Hannibal, Moors, evacuated DMZ between Christians and Moors and so on, until the Christians finally triumphed in the 12th century. In 1218, Alfonso IX of León created the University of Salamanca in the city, the oldest university in Spain and one of the oldest in Europe. By the end of the Spanish Golden Age (roughly 1550-1650, during which Christopher Columbus lectured there on his discoveries), the quality of academics declined, accompanied by a sharp decline in the number of students and the centuries old prestige of Salamanca simply evaporated. During the 1940s efforts were made to reinvigorate the university which today, with 36,000 students, majors in humanities and languages. The Plaza Mayor - the central square - was constructed by Andrés García de Quiñones at the beginning of the 18th century with shaded arcades all around and the ability to accommodate as many as 20,000 people. Regarded as one of the finest squares in Europe, it was originally a venue for bullfights but is currently used for concerts and other more peaceable events. 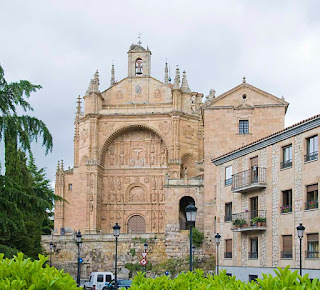 Unusually, Salamanca has two cathedrals that actually adjoin each other. The old Romanesque cathedral was founded in the 12th century while the new one was built in stages, beginning in 1509, in a mix of Late Gothic and Baroque styles and was still being finished in 1734. Included among the carvings on the facade is the unlikely likeness of a space-walking astronaut, which was added by an artist during restoration work in 1992 as a symbol of the 20th century.